If chilly temperatures make you want to snuggle under a blanket in front of a roaring fire, just think about your poor water pipes that can’t escape the cold. You can’t wrap your home in a warm, protective blanket when winter arrives, but a few winterization steps can help ensure your home weathers the winter safely and efficiently. * Protect pipes — Any plumbing pipes that run through uninsulated areas such as a crawl space or attic are at risk for freezing if temperatures plummet. Seal any cracks or openings where pipes exit the home and fit unprotected pipes with pipe sleeves. Insulating pipes can reduce heat loss that makes your water heater work harder and uses more energy, and raise the water temperature 2 to 4 degrees Fahrenheit, according to the U.S. Department of Energy. * Add weather stripping to doors and windows — If your home is drafty, adding weather stripping to seal air leaks can reduce heating bills as much as 20 percent, the DOE says. Identify places where air leaks occur in your home, and choose the right weatherstripping for each area. 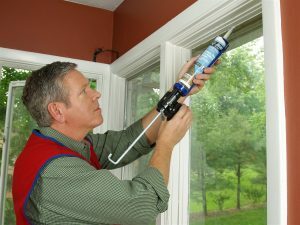 * Caulk around windows and doors — Air can also leak through minute cracks around windows and doors. Sealing such cracks with caulk further reduces the air leaks that make your furnace work harder and your home feel drafty. * Add insulation — Insulation can make your home stay warmer in winter and cooler in summer, and help your heating and cooling systems work more efficiently. How much insulation your home needs depends on factors such as where you live, how old the home is and how well it was insulated, to begin with. If you’re unsure how much insulation your home needs, check out the Energy Star insulation guide. * Protect outdoor plumbing — Whether you have an outdoor shower or a simple hose connection, it’s important to protect outdoor plumbing from freezing. Water freezing in outdoor pipes can cause severe damage and costly water leaks. Turn off water flow to outdoor pipes and flush the water from the system. Remove and store garden hoses for the winter. If you spot any cracks or problems, take care of them right away. Finally, add insulation, such as a hose bib cover to outdoor faucets. * Prepare the lawn for winter — A healthy lawn requires less watering and work in spring than one that’s been ravaged by winter’s rigors. Keep grass mowed until it stops growing, and rake leaves and grass clippings to maximize sun exposure for grass. Mulch around plants and trees to protect them against harsh weather and freezing temperatures. * Clean windows — Sunlight is a natural, cost-effective way to help keep your home warmer during winter. Opening drapes and blinds can maximize the amount of sun that enters a room and help warm it. However, dirty windows can reduce the amount of sunlight that gets through the glass. Plus, clean windows will help make your home feel brighter and lighter during the darkest days of winter.